That's Fluff. In the food bowl. That's when you know it's been a good day. Fluff is Jack's BFF. They have break apart heart necklaces from Claire's and are thinking about getting an apartment together. We see streaks of green and black bolting across our living room at night. On occasion, potted plants have been broken and Fluff left in the center. How a cat can know to stage a crime scene in his favor is beyond me. "What Mom? No. It wasn't me. I didn't kill Planty La Plant. Fluff did." 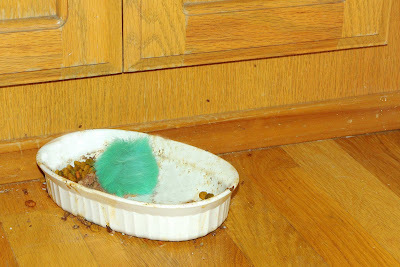 When Fluff and Jack have had a particularly good day together, we find Fluff in the food bowl. It's Jack's way of putting him in a safe place. "You stay there, I'm going to sniff the window." 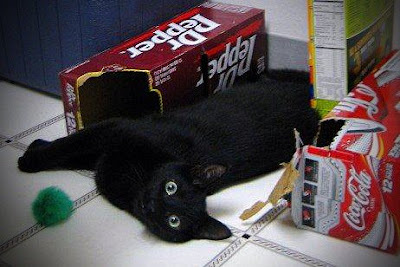 Once, the in-the-food-bowl game changed. 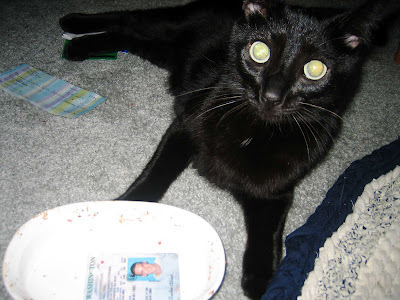 I found Chuck's expired driver's license in the bowl and Jack staring at it longingly. This was back when Chuck was an airline pilot and I like to think this was the ultimate "cry for help" by the left behind child. Next step would have been a butterfly tattoo on his lower back. Good thing Chuck left flying. Prison-tats aren't a good look on feline. So, it was a good day here. Fluff in the food bowl kind of day. I can only imagine what went on here while I was out. Scratch that. I don't want to know. I choose not to know. You know who else has BE FRI + ST END necklaces??? I'm home soon, to deliver your sunglasses and the gift I got for you in Hawaii. Susie! It is so much fun to get caught up on your life. You are darling and so is your husband and your kitty and your blog. Thanks for finding me! (How did you do it, by the way?!) Do you mind if I post a link to your blog on mine?